ISE is the first pro audio trade show of the year in Europe, attracting visitors who are ready to be inspired and connect with other industry professionals. For most audio exhibitors, ISE is essential to their business plans, especially as the show recognizes the significance of pro audio more and more each year. When we first became an exhibitor, ISE was still a specialized AV and systems integrator show with a focus on the European market. Since then, it has developed into a global platform for sharing ideas and insights among other fast-growing crossover industries. This is especially true for companies with a global presence, which use ISE as an opportunity to bring their customers and stakeholders together to converse and do business. While there are other interesting specialized events, ISE offers exhibitors a wider range of market sectors, and this is attractive for attendees in the show’s core market, as well as for various crossover sectors. As Adam Hall is a fast-growing company in the installation, rental, retail and industrial segments, ISE is an important platform to meet existing and new customers. This is not only to showcase the latest product innovations and solutions, but also because it serves as a means to continue building and maintaining relationships with our customers and marketplace. This provides us with much-needed insight into the dynamics of the market and the ensuing evolution of our customers’ needs, to which we can continuously adapt. From developing the next generation of innovative solutions, to our sales and marketing departments, Adam Hall works to provide the most optimal support and relevant communications for our customers. What separates ISE from the rest of the industry’s trade events? We have enjoyed massive growth in the installation markets in recent years, delivering our versatile hybrid of immersive audio and show control to a variety of venues, including museums, galleries, planetariums, expos, retail, theme parks and immersive AV dark rides, as well as the live performance markets of theater, opera and orchestra. We typically see prospects at ISE from practically all of these target markets. What are you most excited about for this year’s show? To support our growth into the AV installation markets, we have introduced a series of touchscreen control advances to directly access our evolutionary spatial processing, as well as essential system management. We’re excited to see the reactions to our new user interface options. The show organizers have recognized that permanent installation is the largest growth opportunity for any pro audio brand—and the importance of pro audio as a vital component in any systems integration, where the A in AV has traditionally been considered the poor relation. Martin Audio has been attending ISE since 2006 (the show’s third year) and as a top 50 exhibitor (out of 1,200), we have been well placed to witness its growth during that period, from 3,500 visitors to 73,000. If our original participation was experimental, the massive growth in the contracting sector quickly made it an essential part of our annual marketing plan. Now, having outgrown the RAI, it is ready to embark on the next chapter in its move to Barcelona in a few years. ISE is the true de facto show catering for this marketplace in EMEA, and its outreach has now visibly extended to Asia and the United States. This observation has enabled us to rationalize and refocus our approach. To complement ISE, we now stage a series of hosted spring and autumn open days, where we can demonstrate our latest suite of products in controlled conditions. In recent years, ISE has evolved from an AV channel event to become the go-to venue for the entire industry and market. It’s now a significant platform for reaching customers and decision-makers from corporations, government, and educational institutions. It’s an optimal place to introduce new products and services in the market, and to give our clients and partners the opportunity to experience our solutions live and in person. The show’s rapid growth is a testament to the overall health of the industry—something Shure is also experiencing. The move to Barcelona in 2021 will accommodate the growing needs of exhibitors and attendees. ISE is always in touch with the latest trends in the market, keeping show-goers and partners 100 percent up to date with everything they need to be successful in today’s AV industry. For example, in today’s world, enterprise IT is expected to cover all aspects of a company’s networked products, so smarter solutions that control each phase of a product’s life cycle will be essential—and I think we’ll see a lot of this at ISE. It’s no longer about creating standalone products that serve just one purpose. It’s about introducing a holistic solution that serves a variety of purposes, all with the goal of providing end users with control, flexibility and a seamless user experience from start to finish. AV technologies and solutions are becoming part of larger ecosystems and need to be integrated seamlessly to perfectly address customer requirements. Therefore, many new partners and players become relevant; trends like “new work,” and changes in the way people and companies communicate and collaborate drives a strong demand for AV solutions. ISE gains interest from around the world—we meet customers from Russia, Australia, South Africa, you name it. But it’s not only the global reach: the show gives us the unique opportunity to speak with a wide variety of customers, ranging from partners, dealers and integrators to end customers. Over the years, ISE has become more and more interesting to end users, too, a development we are very happy about. It’s a very interesting show to attend, both as an exhibitor and attendee, always ensuring a great lineup. As a manufacturer, you are always hoping to have interesting dialogue with your customers, and this show has always provided that. I think the biggest news for many of us will be the permanent relocation of the show to Barcelona in 2021. It’s been quite obvious for a few years now that the show was going to outgrow the available space at the RAI. There is a lot of competition for an increasingly limited amount of available floor space, and with ISE expected to grow by another 10 percent, this problem was only going to get worse. There is a tangible excitement built up around the show; people are visibly excited to go as it allows for creativity, expression and expertise. It draws together multiple disciplines from the creative side—entertainment, experience design, multimedia production—to the more technical side of engineers, designers, integrators and installers. For us, the education element is very important, as our own education program is a pillar of our company. ISE and AVIXA continue to prize their education program and it has grown to be the largest exhibition event for our industry. We expect this year’s show to be the biggest yet, not only in size but in diversity of exhibitors. ISE is now attracting pro audio companies that serve all parts of the installation market. What are you most excited about regarding this year’s show? I know this will be an exciting year regarding seeing more tools for creating immersive sound for live events. Additionally, I expect to see more focus on user interface technologies that provide simpler ways to interface with all types of AV technology. It’s also an opportunity for us to showcase new and existing products and technologies to key stakeholders in the industry. We have some exciting developments in the works that we look forward to exhibiting and unveiling to the install market. I think it’s because the ongoing very low interest rates in Europe continue to fuel investment in the building industry, and the products and services exhibited at ISE are targeting markets that complement that industry. What separates it from the rest of the industry’s trade events? At ISE, we are able to spend quality time focusing on our systems portfolio with people from business areas and channels that we do not meet at other trade shows. Over the past four years, Yamaha has introduced a very comprehensive range of the highest quality hardware and software products that are specifically designed to meet the requirements of the building industry. Given our strong background in DSP and networking technology, as well as our sensibilities for sound and music, we are very happy that we can convey these benefits to a new audience at the ISE show. From our point of view as a manufacturer, we are most excited to show our offering to the install market and meet the customers. We will also unveil a brand new IP network-based loudspeaker technology platform for AV that delivers power, audio, and flexible calibration and management features via a single standard CAT cable. I am sure this will be exciting for our customers as well. It has grown again. Overall, ISE is attracting more and more people from the traditional pro audio field (in Genelec parlance, that means studios/post-production, etc. ), as well as AV. As a result, ISE has started to become one of the most important shows across all segments in the audio business. We are expanding our sales channel in AV and I am excited to meet new AV professionals and companies worldwide. Naturally, ISE is the place to keep up with the AV trends and where our competitors are going. Exhibitors are satisfied because of the huge range of visitors; the show attracts everyone from small restaurant owners to managers of huge commercial installations, and everything in between. Even though ISE primarily caters to the installation market, ISE’s decision to broaden its base to other segments has attracted the support of a lot of manufacturers, including DPA. Another reason for ISE’s expansion is its focus on audio, which is attracting audio companies as exhibitors, and this, in turn, attracts visitors who are interested in sound. We see other shows where pro audio has become less important, so it is encouraging to see that audio is taking more floor space year on year at ISE. ISE is the first big European show of the year and comes at a time when most companies have new budgets to spend. That makes it an attractive proposition from a business point of view. At ISE, we get to talk to people from different industries. This is really important because it allows us to make new contacts and promote our products in new markets. Our microphones are very well known in the live sound and events market, but having access to the installation and conference markets is great because we have a good range of products, such as our gooseneck and podium microphones, that are perfect for these customers. We are gradually expanding our reputation for quality to these markets and have recently handled some high-profile installations at places like Europe’s largest parliament, the Irish presidential inauguration ceremony in Dublin and the Canadian Parliament. It’s a well-organized show with a clear vision and direction, serving an industry driven by innovation. That gives manufacturers compelling reasons for exhibiting at the event to showcase new products and interact with trade customers and partners. I think the sharp focus that ISE has on the AV and systems integration market helps it to stand out. Exhibitors know the type of visitor who will be at the show, and ISE typically delivers very high-quality visitors, in my experience. 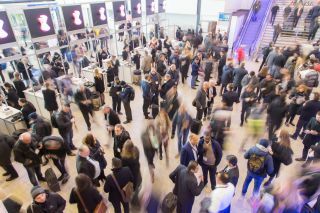 With any event, there’s a level of critical mass needed to become an accepted, “first in the diary” trade show each year and ISE certainly has that: a consistent delivery of the world’s biggest brands on a scale that’s hard for industry visitors to ignore. This article originally appeared in SCN magazine’s sister brand Pro Sound News Europe.